Finally, a senator has taken Supreme Court nominee Brett Kavanaugh to task for his openly hostile perspective on the First Amendment’s Establishment Clause. The Freedom From Religion Foundation had pointed out that Kavanaugh had only faced questioning on state-church issues from friendly quarters. It lamented this lapse because, while Kavanaugh was so studiously quiet on every other substantive issue senators asked about — guns, abortion, health care, and whether or not the president can be indicted — when it came to protecting unconstitutional religious privilege, Kavanaugh felt emboldened to give his unvarnished opinion, however contrary to established precedent it may be. At long last, someone challenged him. Late on Thursday evening, in what must have been hour 30 of the hearing, Sen. Mazie Hirono, D-Hawaii, stepped up to defend the wall of separation between state and church, hitting Kavanaugh with some of the toughest questions he faced and alerting the American people to a staggering contradiction between two of his opinions as a federal judge. Hirono hammered him for his anti-woman hypocrisy in two cases, Garza and Priests for Life, that he ruled on two years apart. In Garza in 2017, Kavanaugh decided that forcing a teenager to carry a pregnancy to term was not an “undue burden” on her rights. In Priests for Life in 2015, he also decided that filling out a two-page, five-blank form was a “substantial burden” on religion. 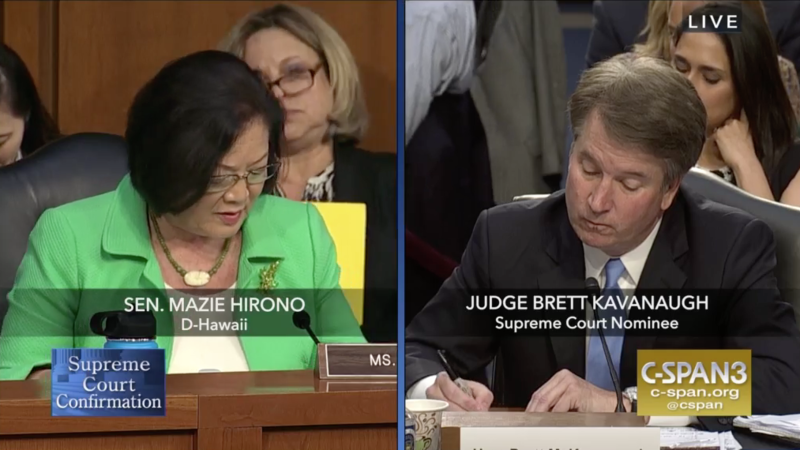 The stances that Kavanaugh took in these two cases are irreconcilable or, as Hirono said twice, his position “defies logic.” Kavanaugh is perfectly willing to protect unconstitutional religious privilege and violate the rights of women. Kavanaugh’s only response was very lame: “precedent.” There’s just one problem with that response: He was writing in dissent in both cases. In other words, even his colleagues thought that he was not applying precedent correctly. Hirono made a nice follow-up statement about using precedent when and how it suits your needs — in these cases to rule against women’s reproductive rights. As FFRF has warned in the past, judicial nominees who claim to blindly apply precedent as “textual originalists” are usually hiding outright judicial activism. Sen. Hirono exposed this brilliantly — and not a moment too soon.